Now Mavra together with Timothy spread theirs. 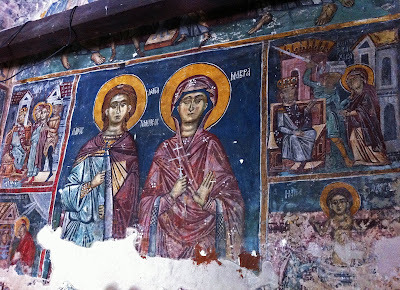 On the third Timothy and Mavra were stretched out on the cross. 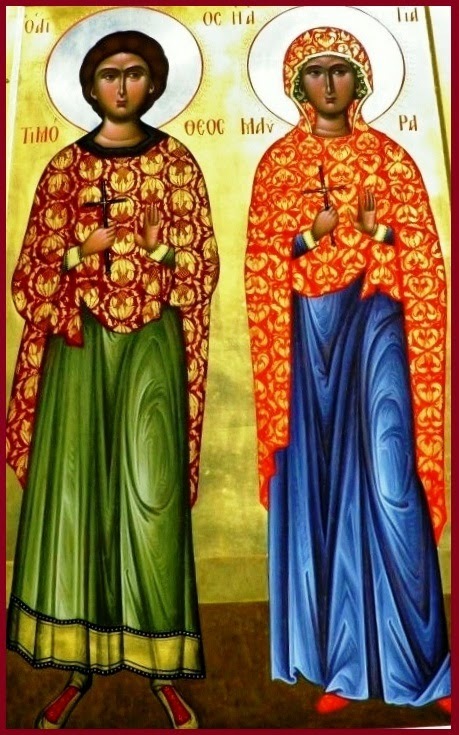 Saint Timothy was from a village called Penapeon, and he belonged to the clergy, namely he was a Reader, who read in the church the sacred oracles. Taking Saint Mavra in marriage, before twenty days had passed after their wedding, he was accused and brought before the governor of the Thebaid, whose name was Arrianus. The governor ordered the Saint to bring the sacred books which he read to the Christians, but the Saint did not submit to this. Speaking in defense to the governor, he said: "I consider the books of the Christians as my own children, on these I am established, and through these I am guarded by Angels." For the power of the divine meanings and words written in these books invited the Holy Angels to help him. And just as no father would willingly give his own children over to death, nor would he give over his sacred books to be burned. With these words the governor became enraged, and he placed two burning iron rods into the ears of the Martyr, which unloosed the pupils of his eyes and they spilled onto the ground. They then tied his joints to a wheel, placed a bridle over his mouth, tied a rock to his neck, and he was hung upside down. Not softened by these tortures, nor was the renowned one fainthearted, for which reason the governor brought before him his wife Mavra, hoping that she would beguile him. Therefore he flattered her and urged her to ornament herself, and then come and offer sacrifice to the idols. 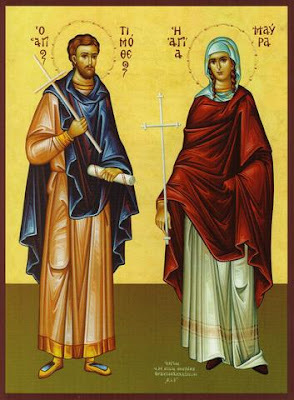 He said to her: "I have heard that only twenty days have passed since you were married to your unfortunate husband Timothy; go therefore and persuade him to obey my words, so you may not lose your husband." The Saint went and instead was persuaded by the teachings of her husband, so she returned and confessed herself to be a Christian before the governor. This enraged the governor, so he shaved off the hair on her head towards her dishonor, and cutting off her fingers, he had her submerged in boiling water. Unharmed and unburnt by this, the Saint returned and said to the governor: "Your cauldron, O governor, is very cold, and if you do not have wood to make it hotter, send me back to my father, and you will receive as much as you want." This left the governor astonished, so he closely approached her, stretched forth his hands, and said to the Saint: "Fetch some water from the cauldron and spill it on my hands." The Saint therefore spilled some water on the hands and face of the governor, and immediately the skin from his hands and face fell off. Enraged by this, he ordered for the Saint to be burned with lit torches, and for the torches to be sprinkled with tar and pitch. The Saint said: "I am greatly astonished by you, O governor. For you were unable to defeat me by the boiling cauldron, now you think you can burn me with one or two torches." 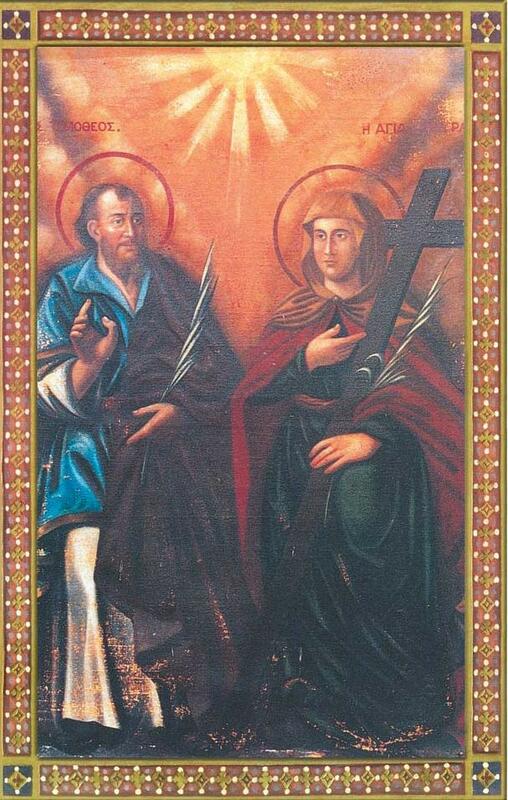 The impious Arrianus was at a loss over this, so he ordered for the two Saints to be crucified opposite each other. Therefore the brave athletes remained on the cross for nine days, encouraging each other, that they may endure the torments and not grow fainthearted. Thus the renowned ones delivered their souls into the hands of God on the tenth day, and they received from Him the crowns of the contest. While the Saints were on the cross, the devil came, and in her imagination he gave Saint Mavra a cup full of honey and milk. By her prayers the Saint rejected it. He also showed the Saint through her imagination a river flowing with milk and honey, and he urged her to drink. She said to the devil: "I do not want to drink from these corruptible things, but from the cup of life and immortality prepared by Christ." By this the devil was defeated, and he withdrew. An Angel of the Lord also came to the them, who grabbed Saint Mavra by the hand, and made it appear that he raised her to heaven, and showed her a bright throne, with a white garment on the throne, and a crown, and he said to her: "These are prepared for you." Then he brought her to a higher place, and showed her another throne, and another most beautiful garment, and another crown, and said to her: "These are prepared for your husband. The difference between the higher and lower throne is clear, for your husband became the benefactor of your salvation, and not you his." Their Synaxis is celebrated in their most-holy Temple at Justinianopolis. 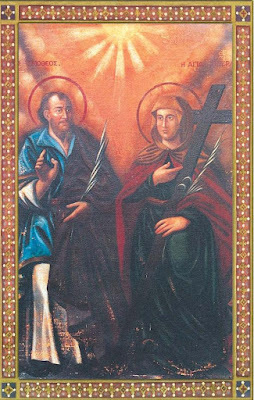 Let us the faithful honour Timothy with Mavra his faithful fellow-athlete, the bride of Christ, and let us praise their bold endurance; for being crucified they lovingly followed Him Who was slain, and Who has nailed all our sins to the Cross. 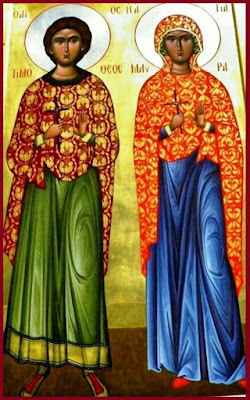 Having endured many wounds and receiving crowns from God, O great Timothy and glorious Mavra, pray to God for us who celebrate your memory, that He may grant peace to His flock and people; for He is the strength of the faithful.